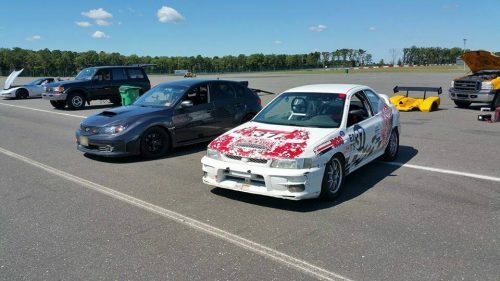 UPDATE October 2016: I had an amazing time racing with my home SJR SCCA at the annual Jersey Road Racing Classic, also known as the Jerk, on NJMP Lightning. Qualifying was in the cold and pouring rain, yet it was my proudest moment racing so far. I scored the overall pole position by well over a second and a half! This was accomplished using Dunlop Direzza street tires. My 2.5 RS is an ITS car, the slowest classed race car on the field. I had a great run later in the day and Sunday running a strong second place in ITS while be overweight by at least 75 lbs and using a junkyard engine way down on power. 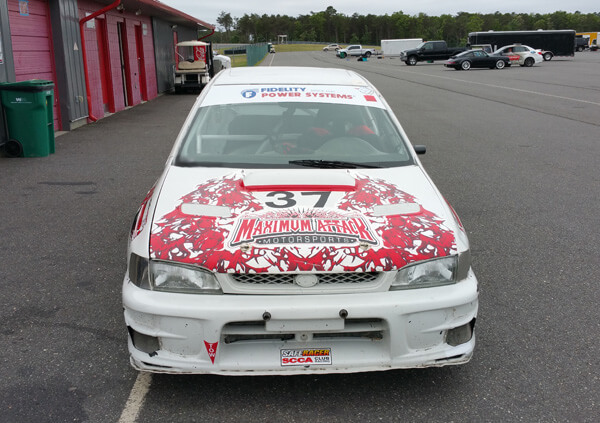 In the 12th lap of the 15 lap final race on Sunday, my passenger front ball joint seared in half going 90+ mph through turn 2 🙁 While my race was over, it was the end of a great run over the weekend and my friend Ed Werry of Maximum Attack Motorsports was amazing supporting my efforts. Loretta Subaru 2.5 RS chilling with her sister Ariella, my 2008 Subaru STi track car. Currently in SCCA ITS trim, Loretta is my 2.5 RS Subaru race car. My original plan was to do an RS / STi or WRX setup and race SCCA STU and PTE / TTE Time Trial in NASA. This would also give me a chance to compete in SCCA Majors and Run Offs, which only allow National Classes, and NASA Nationals. Cost has prohibited me from doing so thus far. My 2.5 RS is most competitive for SCCA ITS where I plan to run her. I love AWD and FWD cars, in addition to RWD. 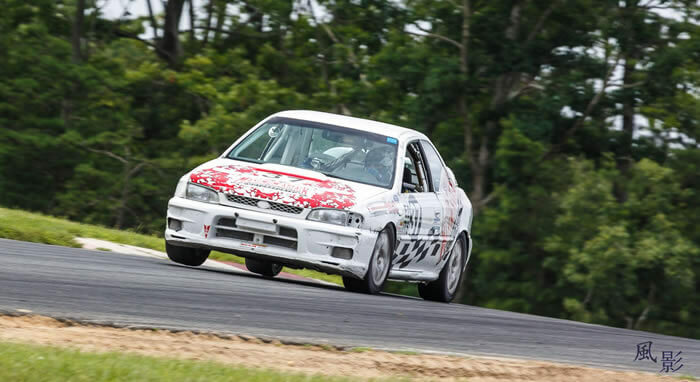 I started in road racing with a Honda Civic, then moved to my ITB Honda Prelude, and now to my AWD baby for ITS and NASA PTE class racing and likely TTE Time Trial for more fun! I acquired my RS Impreza from my friend Ed Werry of Maximum Attack Motorsports, and you can see here in the livery he raced. She was originally built as a killer endurance car, and Ed later converted her to SCCA ITS racing duty. Built for SCCA ITS class, but she’s legal for NASA PTE / TTE and any road course series including Vintage Racing. The 2.5 RS Can be fitted with both WRX and STi driveline swaps if desired. The 2.5 is a light AWD car with a current dry weight of 2525 lbs. She features an outstanding safety cage with NASCAR side rails for driver, and multiple reinforcements. A 20 gallon fuel cell was fitted from her days of endurance racing with SCCA. My 2008 Subaru STi – which is not exactly stock, has a pinup page at this link. There are nearly endless opportunities to leverage Facebook ads to market your business. I focus on mobile-friendly designs that work. All your content is available on mobile and loads fast! I offer a wide range of social media solutions and email marketing solutions for any business need.